Free hand painted designs and own glazes which make vertical and 3D line on slab of cay,firing in high temperature kiln. The artworks are designed both to hang and as funiture in wrought iron stands. 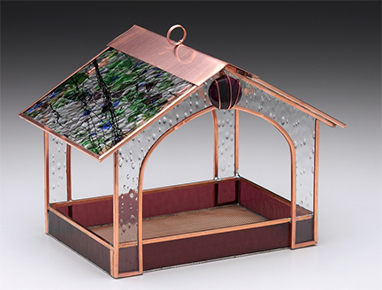 Copper and cedar garden art, artistic and fully functional birdhouses and garden art. All copper hand worked, cedar wood textured and stained. After assembling soulfully worn found objects, I layer patterns under stained glass. Then I add tiles created from etched tarpaper & acrylic paint. I tie all the elements together with grout & paint. The thing that drives me create is the strong desire to make others smile, laugh and be happy. Nothing is more important to me than the happiness of others and it is those things I want to elicit from people that view my unique and whimsical work. My subject matter is animals and nature and I work in clay, from earthenware to hi-fire clays, because it is so willing to move w/ the command of my hands. The movement to pushing and pulling is immediate and gratifying. COLOR is my love so I use bright glazes as well as cold finishes, always in pursuit of bright color to celebrate the piece’s energy and happiness. I often finish pieces with glass, feathers, beads, metal, and/or horsehair to have the maximum control over expressive gestures and stylized subjects all designed to be light, bright and fun to make people smile. Sculpted wind chimes and other suspended pieces that are a collaboration of antique silverware, glass beads, bottles, and other vintage architectural objects. My business developed from a passion for feeding and watching birds for over 50 years, and my artistic skills and talents in working with stained glass. Creating functional birdfeeders that are a work of art is a challenge: the challenge is not the size, but designing 3-dimensional pieces that are functional for the birds and hold up to the weather, especially in Minnesota. The process is to combine functionality and strength with the beauty of glass and copper. I create all of the designs myself then cut all of the glass and copper for the birdfeeders by hand and solder with lead-free solder. Colors of glass are selected that complement each other, yet make an artistic statement in a garden. In the past 10 years I have gotten into kiln work, creating functional bird baths among other things. Dichroic and iridized glass has always fascinated me, and I have a lot of fun turning this magical glass into outdoor pieces of art. 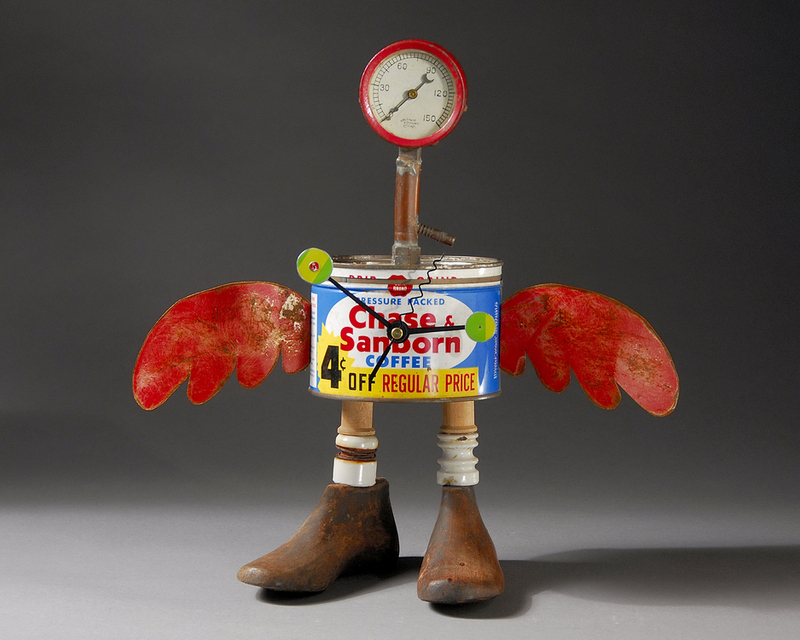 Assemblage pieces are created in response to our throw away society. We creatively "upcycle" found objects into primarily functional works. Scale ranges from floor lamps to tiny pieces. Fabricating plays a key role along with metal working, surface design, and collage. 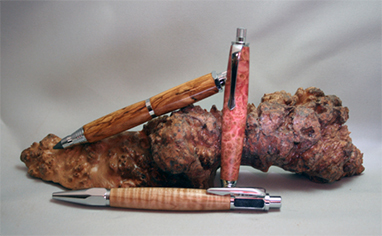 I strive to create functional handmade writing instruments and other useful turned items using a lathe to turn wood, acrylic, and other materials to allow a piece of beauty to enhance your day to day activities. MJ creates narrative abstract compositions in acrylic, reverse painted on repurposed windows and lit with LEDs. Impressionistic needle felted landscapes created from wisps of dyed sheep's wool. The fiber is fused strand by strand in a painterly fashion with a barbed needle to create fabric of the image itself. 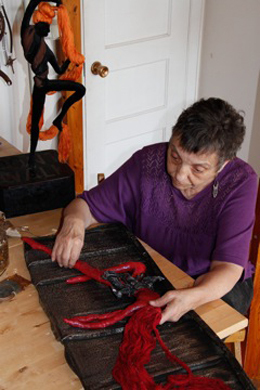 The completed felt textiles are hand finished by the artist in local wood and reclaimed timbers. My mixed media sculptures usually take the form of dancers and are created from recycled objects. The assemblages consist of fabric and salvaged item(s)i.e old bed springs, rusty cans, zippers, wood. The design is determined by the recovered item. Hand built ceramic faerie house, mounted on solid copper vine or stem, creamy magic in the middle. I create handmade leather bound journals using book blocks which I make from a variety of papers including professional grade watercolor paper and a 70lb archival paper that is perfect for both writing and sketching. I then cover each book block in one of my many re-purposed leathers and bind the pages to the cover using the German longstitch method. The covers feature a variety of designs that I create using image transfers of my own photos, block printing, ceramic buttons, skeleton keys and drift wood. I also create mini journal jewelry using the paper and leather scraps leftover from my larger projects as a way to make sure nothing goes to waste.